Beltane is the ultimate holiday of festivity and fertility! This reading harnesses the energy of creation available to us during this time of year to look at how you can take an active role in creating the life you desire! 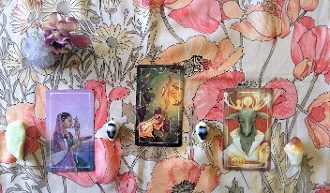 The cards draw your attention to something waiting to be created by you, as well as the duality of that creative process; what you need to receive and to project to get your goal underway. There is no specific question asked with this reading. Rather we leave it open to your Guides and Ancestors to give you the direction you need. Please include your full name and date of birth in special instructions. Readings will be done between April 30th and May 2nd.